This Blackberry Cream Cheese Coffee Cake is packed with flavor. 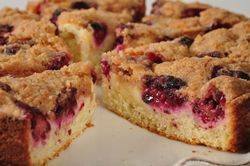 It has four delicious layers, starting with a thin layer of fluffy white butter cake, followed by a creamy smooth cream cheese filling, on which is scattered juicy sweet blackberries, and then the whole cake is smothered with a buttery sweet cinnamon flavored streusel. What a delight. It is good in the afternoon with a cup of tea or coffee, makes a lovely brunch dish, or I often like to serve it as a casual weekday dessert. One characteristic of coffee cakes is their tendency to be very rich, as they are often full of sour cream. Although delicious I wanted a lighter textured cake, so for this Blackberry Coffee Cake I used a butter cake recipe which uses milk instead of sour cream. Once made, the batter is spread over the bottom and a little up the sides of a springform pan. Now, while I have scattered fresh blackberries over the filling you could use fresh raspberries or even blueberries. Another option when berries are out of season is to spread your favorite jam or fruit preserves (about 1/2 cup) (120 ml) over the filling. Of course, no coffee cake is complete without a streusel topping and this one is flavored with cinnamon and it also contains butter which gives it a softer texture. You can serve this cake warm from the oven, at room temperature, or even cold. Blackberry Coffee Cake: Preheat your oven to 350 degrees F (180 degrees C). Butter and flour a 9 inch (23 cm) spring form pan. Streusel topping: In a large bowl, mix together the flour, sugar, and ground cinnamon. Cut in the butter with a pastry blender or fork until it resembles coarse crumbs. Set aside. Cream cheese filling: In your electric mixer or food processor, beat the cream cheese until creamy and smooth. Add the rest of the filling ingredients and beat just until smooth and creamy. Do not over process. Set aside. In the bowl of your electric mixer, with the paddle attachment, (or with a hand mixer) beat the butter until smooth and creamy. Add the sugar and beat until light and fluffy. Scrape down the sides of the bowl as needed. Add the egg and vanilla and beat until incorporated. Add the flour mixture (in three additions), alternately with the milk (in two additions), and beat only until combined. Spread the batter onto the bottom, and slightly up the sides, of the prepared pan. Next, spread the cream cheese filling over the cake batter. Scatter the fresh berries over the filling and top with the streusel. Bake for about 60 to 70 minutes or until the streusel is golden brown and a toothpick inserted in the center of the cake comes out clean. Remove from oven and place on a wire rack to cool slightly.